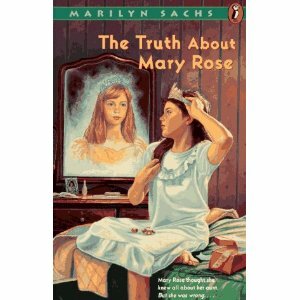 In browsing Amazon looking for this book, I realised I read rather a lot of Marilyn Sachs books as a child, but I didn’t release at the time, because I didn’t pay much attention to the author’s name when I was young. I picked up a book because I liked the cover, or the blurb on the back made it sound good. I’ve generally remembered titles, however, which is why I’m able to locate all these books I read in childhood, 30-odd years after the fact. Marilyn Sachs wrote a few books featuring a character called Veronica Ganz, a troublesome girl with a reputation of being a bully, growing up in the US in the 1940s. I didn’t know this when I discovered THE TRUTH ABOUT MARY ROSE, which I think I found in the library when I was about 10. I don’t actually remember what the cover of the book I read looked like – it certainly wasn’t the one featured here, which appears to have been created for a modern re-release. Veronica Ganz the bully is all grown up in this book, and has a respectable career as a doctor. The narrator of the story is Mary Rose, Veronica’s 11-year-old daughter, named after her aunt, who died in a house fire as a child (Veronica’s sister Mary Rose appears in the books about the young Veronica Ganz, portrayed as an irritating and whiny little sister, but there’s no hint of her dreadful fate). Veronica’s daughter has grown up idolising the memory of her aunt, who she believes died a heroine, rescuing her younger brother Stanley from the fire. Only when the young protagonist eavesdrops on a conversation she shouldn’t be listening to, when her uncle Stanley recounts what really happened that fateful night does she learn the truth, and her illusions are brutally shattered. I identified with Mary Rose when I read this book because like her I had a habit of creeping out of bed late at night, so I could listen to the conversations adults have when they think all the children are asleep. Like Mary Rose, I learned some painful truths this way. It’s been over 30 years since I read this book but it’s stayed with me all this time. It deals with some pretty heavy issues – after all, the main plot of the story revolves around a child dying in a house fire. The concept of having childhood illusions shattered as one grows up is a major theme, too. 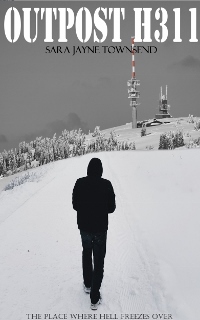 And of course there is a lesson to be learned also – if you illicitly eavescrop on private conversations, you might hear things you wish you hadn’t. I still wonder sometimes where Marilyn Sachs got the idea of a child who creeps out of bed to eavesdrop on the adult conversations. Did she do this herself as a child, or know someone else who did? I’m willing to bet I wasn’t the only kid who did this. Of course, being nosy is a common trait amongst writers – listening to other people’s conversations is the best way to get an insight into human nature. Being nosy is a useful trait for amateur sleuths, too, so I decided to give my amateur sleuth, Shara Summers, the same bad habit as a child. She, however, has less guilt about it than I do. Anyone else out there willing to admit that they were this nosy as a child?